Average expiry date is 2 to 2.5 years. Do you ship to California, USA, without a prescription? Yes we ship to California, All the products we currently sell are "over the counter" products in the country they are shipped from and no prescription is required. Why one time purchase is cheaper than auto delivery every 3 months ? The intent is to encourage and reward customers for scheduling their orders in advance. This feature can be cancelled or rescheduled at anytime without penalty. 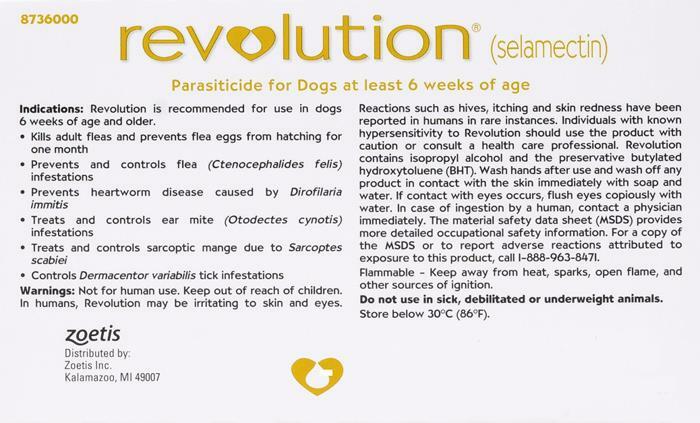 Should my golden retriever takes this revolution every month starting from June to Nov ? If yes, how many packs should I buy ? I am living in Toronto, can I get it before June ? One dose lasts a month so with June to Nov. (5 months) your prescribed dosage span, qty 1 X 6 pack or qty 2 X 3 packs would be needed. Yes, June would be an easy target because orders generally take 10 to 15 business/working days for delivery. Do you not sell Revolution Teal for a dog over 88 lbs?